We’ve talked a lot about office decor on this blog — how to decorate your desk, how to liven up your office walls, what the logistics are for decorating your office, and how to know when your office decor is too nice — but we’ve never had a true expert weigh in. So today I’m thrilled to welcome Sayeh Pezeshki, an office stylist who founded the blog The Office Stylist and created a stylish LA coworking space. She was nice enough to round up her top five crimes in office decor for us — take it away, Sayeh! It’s your office—not solitary confinement! You should feel excited and energized in your work space, not like a prisoner. Deck out your walls with fun prints, wallpaper, or paint colors. Anything is better than plain, white, boring office walls. 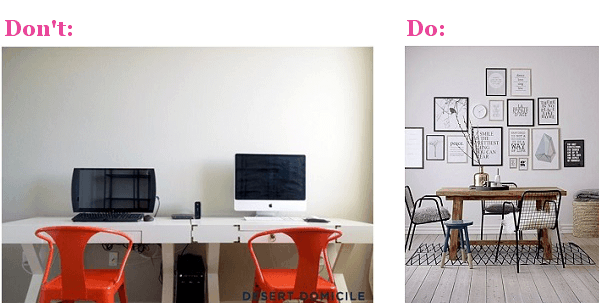 “Don’t” image via Desert Domicile, “Do” image via My Scandinavian Home. Your desk/chair is where you spend the majority of the time in your office, right? That’s why I’ll never understand people who settle for anything less than spectacular. It’s the first thing you see when you walk in, the entire focal point of your office too. Make sure that your work station is not only easy on your back, but easy on the eyes. Your space should be just what it sounds like: yours. Don’t settle for something straight out of a catalog. Mix patterns, pieces, and styles to create a workspace that is unique to you. Here’s a crime many decorating newbies fall for: don’t put all your furniture against a wall! It will make your space seem smaller than it actually is. Spread your chairs, desk, tables around the room, and you will be surprised at how much more open it instantly feels. Nothing is worse than a bed smashed into the corner of a room or a desk that feels like its stuffed away in a closet. “DON’T” image via Claffisica, “do” image via Baobab Interiors. While many people may not appear at first glance to be a hoarder, hoarding comes in many forms. Décor hoarding looks like holding onto pieces that are broken or ugly but serve a purpose, or simply allowing a bunch of clutter to take over your space. Do some spring/summer cleaning and stop office hoarding in its tracks. What are the worst office crimes you’ve seen? Tell me below in the comments! LA-area readers: Check out WORK. by The Office Stylist, LA’s Most Stylish Co-Working space. I think nearly everyone reading this blog works in an office. As a general rule, when you get a professional job, it comes with business cards, a 401k, and a fully furnished office. So tips 2, 3, and 4 are pretty useless. And “decor hoarding”? Really? If what you mean is “hanging onto outdated clutter ” it would be better to say that than to rope in an actual mental illness. Are guest posts edited at all? Because this poster seems to actually have a ton of really interesting ideas to share, but not to really get the audience, which seems like the kind of feedback an editor should be providing. Actually, tip #4 is something that many in my law office could benefit from. And partners get to pick out their furniture. And #3 could apply not just to furniture but also to decor. Everyone needs to sorta calm down. I’m thinking (hoping?) that the poster is referring more towards home offices than those provided by our jobs. Her tips might be more helpful in that context. I could be wrong, though. 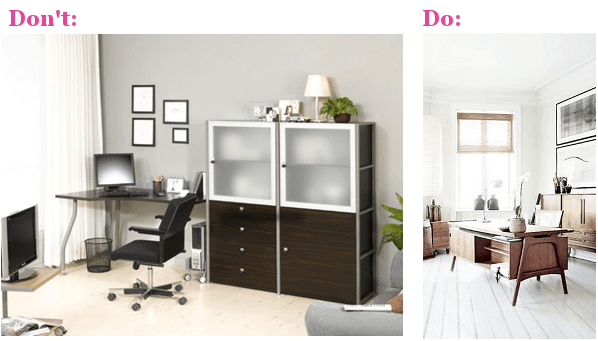 Yes, this post has me rethinking my home office (where I am guilty of #4 and #5), but I can’t really apply any of this (except #1, which I have got covered) to my office office. I wish I could….but I can’t, and even the partners in my firm don’t really fully furnish their offices themselves. Agreed – these tips can work for home offices but not so much for office-offices. +1 This post belongs on a different type of blog. I love this post and I’m an attorney in a stuffy law firm where all my furniture came included with my office. Still, all the tips are applicable. Even #4 since no self-respecting office space would have your computer shoved into a corner with your back to the door. Does anyone’s office actually have that? Also, lawyers aren’t the only ones who read this blog. Don’t be a narcissist. Um pretty sure I didn’t refer to lawyers once in my post. I am not a lawyer. In my office very few people have their own office and almost all of the larger multi-person offices have a desk where your back is to the door. People try to move ASAP but when we are crowded it’s just not always possible. Also some of the companies I consult for have cubes with built-in desks and those are always set up to have your back to the door (there isn’t space to put the desk anywhere else). One of the companies is even going to an open office floorplan and has long tables with no partitions at all. It’s like working at a cafeteria table. Cafeteria table – this sounds just dreadful. I’m in a cube. facing the corner. Like Baby in Dirty Dancing. With my back against the opening of the cube. I have my MBA. Please pity me. Baby actually had her back to the corner. All the better to see Lisa dancing in the coconut bra. I disagree. It is ALL helpful, b/c you should see the dump I am now sitteing in. When we MOVE, I am goeing to insist that we get it decoreated RIGHT. I have a chair that date’s from the 1940’s and a desk with so much schmuttz on it that I am not sure if it is realy wood or not. There is petrified gum and food in the drawer’s and I have NO window. The office was probabley last painted in the 1960’s and there is grungy carpeting that smells whenver it is HUMIDD out. FOOEY! And Frank’s chair is worse. It has a cushion on it, but he often farts into it and then sometime’s spills coffee on it so it stink’s! DOUBEL FOOEY! Onley the manageing partner has nice furniture, and he want’s to give it to me when we move. I want NEW furniture b/c I am a partner, and I am sure he also farts in his chair which at least is leather, but his tuchus is alot bigger then mine and I do NOT want a chair shaped like his tuchus. TRIPEL FOOEY! I had no decision in picking the furniture for my office but did have a say how I positioned the furniture. I actually spent the weekend with DH moving stuff around to my liking. Also, everyone can bring in their own inboxes or pencil holders so these tips are generally helpful. I go roaming everyday just to find a spot. I agree in that this was a fairly helpless post. Professionally, I have very few options for my office. I can rearrange my furniture, trade a metal bookcase for another metal bookcase or supply cabinet, put up whiteboards & cork boards, and hang up pictures and degrees. My chairs are standard issue, I don’t choose the wall color, and our furniture is by Steelcase. I have a window which is a plus, and I’m getting a rug to lay over the industrial brown on my floor. Overall, I think it’s a nice office but it would never be on pinterest. My home office is my own – no one sees it, so what do I care what they think? It’s comfortable and attractive to me, and that’s all that matters. Great post! While our offices come furnished we do have flexibility on decor, probably set-up in most cases etc. Also, partners get to decorate their own offices with whatever furniture, etc. I personally think it’s an office crime when a senior person doesn’t have a set up where you can sit in a chair across from their desk for a chat, etc. I think a chair or two for guests is a must. I think your tip about the chair or two for guests is great and much more useful than anything suggested in the actual post. It seems to be all about having an office that looks good rather than an office that functions well. – sits in a cubicle. My god, yes, that awkward moment when you go into a partner’s office and don’t know whether to sit at their little table and chairs halfway across the room or the chair strangely on the wall perpendicular to the desk, or… i don’t know, its scary going into a partner’s office to begin with. I just pick up a chair and take it over to the desk so that I can sit across from the other person. Works fine. I am newly in an office with a chair for guests and I get a lot more guests than when folks had to drag their own chair in. I haven’t decided if that’s good or bad yet. The person next to me solved this with a pile of papers and stuff on the chair. If she wanted you to stay, she cleared the chair. If she didn’t want you to interrupt her, she let you stand. May not have been the most polite thing in the world, but I was highly amused when she explained her system to me. Ha. Meg Murray, my husband does this too! As someone who works in a cube, this post is particularly not suited to me. I don’t have much say on decor and I’m about to be moved for the 3rd time in 2 years. I have the most recent holiday cards of my nieces up, as well as some tips/information about the software I use. My cube is very small. +1. I alternate between my lab bench and tiny cube. I have nothing in my cube except my coffee mug. Very few people decorate their cubes where I work. I have a cube and I totally hoard. It just takes less stuff to be hoarding with less space. I think you really overestimate how much choice I had in my office. The furniture is provided by my company. I can rearrange my office, and I have so that I face the door, and my bookcase is easily accessed. I can pick wall decor. I guess I could buy a chair, but they give us Aerons in the appropriate size for our height (and do an erg. assessent of our desk setups), so why would I pick a different office chair? I just wanted to say it’s awesome that you get an ergonomic assessment of your setup. My firm will let us order special chairs, computer mice/keyboards, and standing desks if we need them, but there is no guidance on how high the desk should be vs. chair vs. monitor, etc. Everyone at my firm gets an adjustable standing/sitting desk. It is really freaking amazing. Helps with alertness and calories. Have you really noticed a difference with calories? I’m on the fence – if I get one it comes out of my pocket. This is very timely for me because I just decided I couldn’t take my blank walls anymore and ordered a framed print yesterday. Now I just have to figure out how to get it to the office on my 1.5 mile walk + 2 metro trains commute…. have it shipped to the office.. Wish I could but it’s government, so it’s forbidden. I got in trouble once just for dropping a card to my mom in the office mail. I work for a governmental agency. Our furniture is so old – mid-century – that it is coming back into style. Haha, that’s excellent. I’ve been in a lot of DC offices, so I know exactly what you mean, too. There’s nothing like blonde oak to make you feel right at home in your office. Yep, I’ve worked for agencies that still have metal desks, which now look awesome and vintage. I have wood paneling. Everywhere and in every shade. I don’t think that’s coming back in style any time soon. Luckily I love my job and my office so I don’t care – I find it sort of charming now. I do also think that this post is not helpful for those who work anywhere where a readily furnished office is already provided for you. Thinking of my own workplace, I couldn’t get away with decorating my office like it is shown on the pictures with the Dos; my office has rules where the furniture is placed and which ones are provided. But I do think some ideas are great for those people who could build their own offices or have more say in how their office could look like. I work for a boss who gets twitchy when employees don’t have some personal stuff in their office. He thinks it means they are unhappy/leaving. I told him not to worry as long as my coffee pot is here, I’ll be here. Also, working for the Gov’t, I’ve had to do inspections of my employees spaces to ensure they hadn’t incorporated any potentially offensive decor into their spaces. Fun times. Since we are a law office, it was mostly an academic exercise for our division, but for other offices in my organization, I’m certain there were a few issues. Would love to hear about what was deemed potentially offensive. I had a colleague with large religious items at her desk in an open-plan, government office. They were easy to spot as religious items from 20 ft away and sat next to her “personal” collection of judgy religious materials that she kept on the edge of her desk in case “the spirit” moved you to take some. The cover of at least one of them was “SINNERS REPENT!”. She also had a radio at her desk playing a religious and damnation-centered radio show for an hour each morning. This person also simply didn’t do her work. We took it over because if she had work to do, she’d stash it somewhere and claim it was done. Entire court cases went down the tubes because of her. Why was she never fired or reprimanded? She was very old and on the verge of retirement. Also, she’d been working there so long that she had work protections that no one else could even dream of. Her retirement party was mostly a celebration that they could finally replace her. Your boss has a point. I only had a plant because I traveled via bus or bicycle and wanted to leave town. So many people commented on my lack of decor, and eventually a co-worker gave me decorations. When visiting a male peer’s office, I noticed his lack of decor. I asked him if anyone ever said anything about his non-decor, and they hadn’t done so. It’s hard to tell how much of the difference in situations was due to our genders, or the fact that I had more office visitors. So sorry, not in law, but really most of the days all I have time to do is try to throw out the used coffee cups and gather dirty dishes off my desk. I appreciate the idea of style over function, but YEESH. As a gray on gray on gray ala mid 80s cube deweller, I’d be interested in tips that spice up your cube! My one tip, has been oddly enough to get matching small push pins. It makes the things I have up in my cube seem so much more neat and orderly. Our offices are newly remodeled and the chosen color scheme – more modern! – is grey on grey on grey. I feel like I’ve been unwittingly slotted into Abnegation. Cute push pins are a great idea! One of my walls is a cork board so that would be an easy way to decorate. I’ve been in my office a year now and still haven’t put anything up other than my degree. Next on my list is getting an office-friendly (no sun needed) plant. I get clear pushpins and then paint them with my oodles of nailpolishes that I probably shouldn’t have in a drawer in my office. I’ve seen really cute push pins lately – kate spade has cute bows and target has cute studs. I don’t even have a cube. I DREAM of having a cube again. We have these round pods that are shared by three people, so I get a 120 degree wedge with a low wall on each side separating me from the other podmates. One of the walls is a whiteboard and the other is fabric. I have a calendar and a couple of small bits of art tacked up, but that’s about the extent of what I can do. I suppose I could bring in some spiffier desk accessories than the bland ones I snagged from the supply cupboard 7 years ago, but for now the most stylish thing I have on my desk is an Isaac Mizrahi pattern on my Kleenex box. I have a twenty (!) foot white wall in my office I need to fill. Any tips that are super budget friendly as I am about to close on a house and also have to decorate that? My diplomas/law licenses are already going on my other eight foot white wall space. I think I am mostly daunted by how to fill such a ridiculously huge space. can you put a couch there? I wish I had couch space. Yes. I would give anything to have the space for a comfortable chair to read in! For a really budget idea, buy a large canvas (or several) and paint it yourself Rothko-style (say yellow and orange). Or get some pretty maps and frame them in big poster frames. Ikea has cheap frames, as does BB&B and Sam Flax, and National Geographic online has really pretty maps you can buy for $10-30. (you can also get it at Kate’s Paperie or Sam Flax). A cheap and easy fix is to stretch pretty fabric over wood frames. I have my own office that I was able to decorate, and I followed pretty much all of these tips. I had my pick of office furniture that the firm owned that wasn’t in use, or picking my own stuff (paid for by firm, within reason). I picked a vintage desk that the office had (owner’s sister is a crazy vintage collector and doesn’t have enough room for her stuff, so she “loaned” it to owner 10 years ago to store for her and use while storing, and I don’t think she remembers it’s still here). I ordered my own comfy desk chair, suitable for my height. The office suite was being reconfigured by the building (my firm was moving from a smaller suite in the same building), so I had my choice of 4 basic colors (grey, white, beige or other beige) for the walls, and I also chose a small upgrade (for an extra cost) of having a custom color painted on 1 wall. I have art or diplomas on all walls, and plenty of chairs for guests. A few guest chairs are directly across from my desk (from West Elm, wooden, colorful and comfortable enough – I wouldn’t want to sit in them all day, but they’re fine for an hour or two, and sometimes I sit in those to work just for a change of perspective), and the rest of the guest chairs (upholstered hand-me-downs from my dad when he retired) are along the back wall. I eventually want to replace those with a small love seat (the largest type of couch that would fit in my office), but I haven’t yet found a couch that (1) I like, and that (2) fits in the space (3) for a price I’m willing to pay. I didn’t get first pick of offices within the suite, but I was fairly high up on the list, so I actually got my first choice space. I picked the office that is not the largest but still fairly big, the most remote from the entrance (so it’s quiet) and has a lovely south/southwestern view, so lots of light. The firm got to choose hardwood or carpet for the suite, and we chose hardwood for offices, carpet for hallway and common areas (to reduce sound). I love the hardwood floors. I work in a vintage high-rise building downtown Chicago. I sometimes walk into the lobby of my building and see people on the architectural walking tours staring up at the ceiling or looking down at the floors. I am super happy in my current office space. I like the color and personal details of the furniture and décor. When my firm moved suites, I had already been with them a few years and the move was the first time I’d ever been able to decorate like this at any job, and it makes such a difference in how at home I feel in my office. This sounds lovely. Sometimes I am one of the people on those tours. It’s nice to hear that some folks do have beautiful, comfortable work space. Speaking of office décor – I am a big fan of personalizing my space so I actually want to be there and one thing I did recently that’s made me so happy is bring in nice plates. I was flea marketing and found these two really pretty floral plates that I really don’t need at home but I liked them so much I brought them in to work. Now if I am eating at my desk it feels all fancy. Sounds silly, but it’s really elevated my lunches somehow and makes me want to take more care with my food, too. 1. Bring in a nice mug (I have bright red one, it makes me happy). 3. Bring in a small plant, maybe a little a seasonal one. I like to get the small $5-6 ones at Trader Joe’s. They last 1-2 months and it’s nice to have flowers on my desk. 8. If you have shelves, get some old reference books to put there. This is also a good spot for those old leather textbooks you won’t use but that for sentimental reasons you don’t want to throw away. I rarely need my reference books because everything is online but they do come in handy and it just looks so nice. I’ve actually become a bit of a scavenger – every time someone who’s been in my office for 50 years retires I go see if I can take a few of their fancier books for my collection. At first, I thought number 1 said rug, not mug. Rugs are also an idea. My ex did that with his cubicle – put in a rug, a pillow on the back of the chair, and a lamp, plus a cappuccino machine (this was in the late 90s) that he shared with 2 office friends, and plus a whiteboard and some photos/cartoons/pictures on the cubicle walls. For a cubicle, it was pretty nicely personalized. Definitely agree a rug on the “guest” side (not under your chair) is a great way to cozy things up! Can we talk hanging your degrees in your (not home) office? Especially professional ones? Current practice seems, from my unscientific sample, to be all over the place, especially among people under 40 or so, and I’d be interested to know where others fall on this issue. I hung mine, but I’m an attorney and I think that’s pretty standard. At most of the places I’ve worked, the other lawyers hung theirs as well. I also hung my state bar and federal court admission certificates. My office framed the admissions stuff for me, and my parents had my undergrad and law school diplomas framed as a law school graduation gift. I never hung my undergrad diploma at any jobs I had before getting my law degree. Abogada – So sorry, I accidentally reported you! Grey Falcon – I have a BA and an MPA and I have my degrees up … purely because otherwise there would be nothing on my office walls at all. Everyone who has said something has only said positive things. I think, being the most junior and youngest professional in the office, it’s lent me some credibility. I work in executive branch government. I work at a university, and the key differences between faculty and professional staff offices are three things: diplomas/certifications, mess, and books. And dust, but that goes with mess. Most of the professional staff have nice prints on the walls, personal touches, a little color here and there, perhaps a rug (which makes a huge difference. The faculty seem to be content with degrees and awards, journals, books, and dust. As I’m both faculty & a manager, I envision both – degrees and awards, journals, books, but also some photos and prints and some professional memorabilia. I’m not sure why staff don’t put their degrees up – it’s a little odd – but I suppose they feel intimidated by the multiple degrees from faculty? Or they don’t care what their qualifications are. In business, I saw a mix – some who did (mostly if they had advanced degrees and/or were Ivy League alums), and some who didn’t. You guise. We don’t expect every single clothing post to be right for our body type, or our budget, or our style. Why do we expect all of the non-clothing guest posts to apply to each of us? Approach like the mom posts here – if you’re not interested, move on! No one approaches the mom posts that way. If they’re not interested, they criticize. “Don’t settle for anything straight out of a catalog?” “I’ll never understand people who settle for anything less than spectactular” – when it comes to an OFFICE DESK? Excuse me while I LOL all the way back to my modest cubicle at a nonprofit. Yes, tone-deaf is certainly how I would describe this post.